Champ’s Story – Miracle Dog #306! 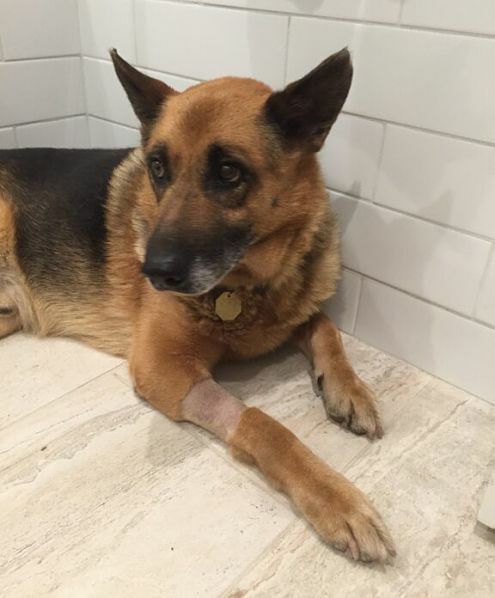 This Beth Miller Erman’s wonderful story about her Miracle Dog, Champ. I love these stories and can never get enough. Champ’s story is especially powerful for me because he is Miracle Dog rescue #306. Our sweet Dolly is #307! I hope you feel the same. It’s especially sweet to share these wonderful stories of love and triumph during this, the Christmas season. Enjoy! 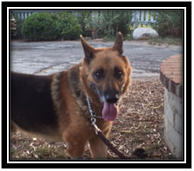 “I lost my first German Shepherd, a smart and loyal black-and-cream girl named Lindy, in July 2010. I felt like I had lost part of my being when she died. We still had my husband’s two dogs when she died (we are a blended family), but it wasn’t the same. She and I had made it through 13 years together. Well-meaning people would tell me about other German Shepherds that became available, but I wasn’t ready, but I knew that I would know when the right one came along. That happened in mid-April 2014, when Serendipity German Shepherd Dog Rescue posted a photo of a couple of their rescues lying on a yellow blanket in a park. One was named Champ, and he had the classic GSD head tilt in the photo. As soon as I saw that picture, I knew he was the one. Serendipity was looking for a foster or adopter for him since he was in boarding at the time. By this time, we had lost all of our dogs and one of my cats, so I asked my husband if he would consider fostering Champ. He said yes, and we went to meet Champ at the kennel the following weekend. Champ was very anxious when we met him and didn’t really want to be petted. He ran around the enclosed yard, and we played ball a bit. He was way too thin, missing some hair and needed some TLC. We were approved for adoption, and brought him home May 1, 2014. My husband and I have had many dogs in our lives, but none of them were like Champ. High-strung and anxious didn’t begin to describe him. He reacted to every noise, every movement outside of the window, didn’t have very good leash manners, and was extremely reactive with other dogs. Even at a low weight, he was strong enough to pull me down. We couldn’t have people come to the house because he was so aggressive. We had our dining room chairs lined up in front of the front windows to keep him from going through them. I had to barricade rooms of the house to keep him from hurting my elderly cat. The whole neighborhood was afraid of him. After 10 days, we realized we were in over our heads with this one. We contacted a local dog training group that offered behavioral evaluations and had a one-hour evaluation. We were recommended for a class (appropriately) called “Dogs with Issues,” but it wasn’t set to start until fall, and we knew we couldn’t wait that long. We tried another trainer, but her style and Champ’s issues weren’t a good fit. The volunteers at Serendipity were always available for help and even came over to watch Champ’s behavior themselves and offer recommendations. We were pretty much at the end of our ropes when we learned about Casey Ray St. Louis Dog Trainers. One of the Serendipity volunteers who had helped us with adopting Champ suggested them, and we went to talk with Casey. Champ showed his true colors at the meeting, and we agreed that a two-week Stay & Learn, followed by weekly group training, would be the best thing for all of us. It didn’t happen overnight, but Champ is a very different dog than he was before we started training with Casey’s team. We have missed only a handful of group training classes in 2.5 years because he needs the structure and socialization. He is still reactive, but we are able to control him in those situations now, and it’s at a significantly lower level than all-out Cujo like he was in 2014. He is often the star of the class. We even did a 6-week agility class, and it was as if he was born for agility. He mastered it really quickly. To continue that, we take him to local playgrounds when children aren’t present and let him go up the climbs and down the slides. There is no playground he can’t conquer! Emotionally, he has really come around. It took about 6 months with us before he wagged his tail, and probably 18 months before he would sit down next to one of us on the floor. He’s not much of a snuggler, but he does love to be petted and groomed. What a terrific story! Thank you, Beth, for sharing. It’s amazing what you’ve accomplished in such a relatively short time. We who have had the joy of having a Miracle Dog (or other adopted rescue) don’t know exactly where our dogs have been prior to rescue or what their lives were like. The best we can do is to give them time, consistency, and strong love to help them learn that their lives are forever changed and that they will never need to be afraid again. This is a post directly from the Miracle GSD Network. They’ve graciously allowed me to post it, along with photos. Several people over the past couple of years have asked me who or what the Miracle GSD Network is. It’s definitely WHO. 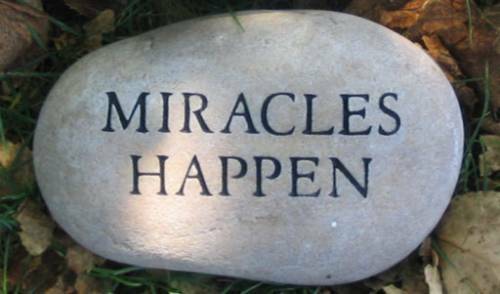 Miracle was started by a group of people who were incensed to find out how many German Shepherd Dogs (GSDs) were being euthanized in California shelters. 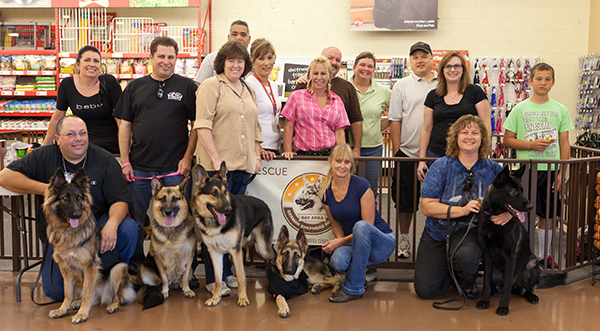 They made a pledge that they would form a network of caring individuals who would get as many GSDs out of these high-kill shelters as possible, and get them to legitimate rescue organizations across the country. Over the years, Miracle has grown to a network of many people who have taken these dogs into their rescues, been foster homes for the dogs, adopted the dogs, and/or been donors. The core group is still in place and responsible for keeping the lines of communication open and doing the “heavy lifting.” The Miracle GSD Network has a Facebook page where updates and happy stories about the Miracle Dog alumni. https://www.facebook.com/groups/310605105708097 . There are always more dogs to get out of high-kill shelters. I, for one, am so grateful that Miracle GSD Network exists. It’s thanks to them that we have our beautiful Dolly (Miracle Dog #307). Few dogs have tugged at our hearts more than Tito, with his wonky head and his sweet demeanor. We knew the moment we saw him back in March 2014 at the Downey Shelter in CA that we needed to help him. Luckily, the wonderful Thulani program for seniors and hospice dogs saw the same thing we did in him, and stepped up to help, and Tito became Miracle Dog #328. We are sad to report that our Tito went to the bridge about a month ago. He had a GREAT end of life with his adopter Morris who took fantastic care of him. Morris sent us this wonderful Tribute, so we could all get a glimpse at Tito’s life for the past 2 years. RUN FREE AT THE BRIDGE SWEET TITO! He didn’t look exactly the way you’d expect a Shepherd to look, but he had a way about him. He was rescued from the L.A. County Animal Shelter in Downey, and I identified with him right away. Having spent most of my life in that general area, I knew there were some rough areas in that vicinity. He had been an “owner surrender” because they thought he had had a stroke and wanted him to be PTS. He actually was suffering from the benign condition known as “Old Dog Vestibular”… which NEVER occurred again! I often wondered what his life was like before the Thulani program. He had a way about him. He wanted to be friends right away, and we were, from the beginning. He wanted to fit in with the rest of the pack: another male GSD, a male Chihuahua, and a two-legged couple, and he did, with ease, by watching the other dogs and learning the pack’s routine, expectations and the tricks they knew. Early on, we battled with a few of his health issues, especially stubborn ear and urinary tract infections. In due course they were resolved, but in the interim he was confined to the laundry room to minimize the impact of “accidents”. Before too long he “promoted” himself, quietly and without adieu, out of the laundry room and into the kitchen. By then, his first infection had resolved, and we said he had promoted himself to Sergeant. Then there was a relapse, and another round of antibiotics, and, at last, a complete cure – he promoted himself into the dining room. Now, we said he had promoted himself to Captain. When the pack came into the house in the evening from their day outside, and the door to the house was opened to him, he was oh sooo happy to come inside. So, he picked-up an alias of “Happy”. I wondered what his life had been like before Thulani… was he ever allowed inside? Scars on his hind feet and elbows, where fur refused to grow, suggested he might have spent many, many days lying on a concrete slab somewhere. People often commented on how gentle and sweet he was – he was – all 90 pounds of him! He just wanted to fit-in and be with the pack. He had a way about him. He was “Happy” during our two years with him, enjoying camping trips with the pack, and especially his morning constitutional walks, sniffing here, peeing there, lagging behind but enjoying every foot of the 1/2 mile walk. In his last 4 weeks, he developed a paralysis of his hind quarters. It had been gradually coming on for several months, showing its face as a dragging of the left leg, but in that last 4 weeks, it developed into a full paralysis, including a fatal inability to urinate – if you don’t urinate, you don’t live. He never complained – he was a trooper! Heroes come in all shapes, sizes, and ages. Real heroes don’t wear capes. If you met a true hero on the street, you probably wouldn’t even realize that you’re in the presence of greatness. A couple of years ago, we were in the presence of many, many heroes. These are everyday people who were courageous enough to take a chance on adopting a Miracle dog. 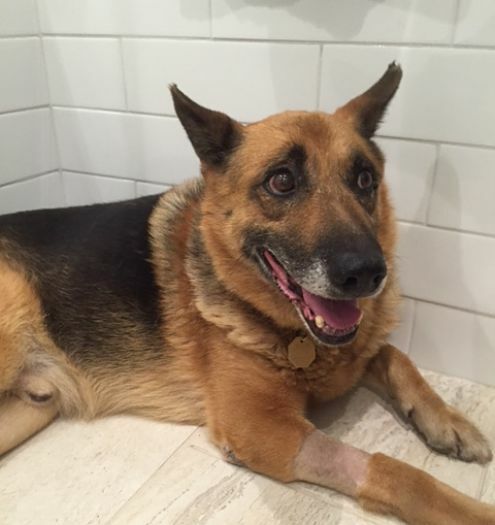 If you’ve read my blog in the past, you know that Miracle dogs are German Shepherd Dogs (or GSD mixes) who – through no fault of their own – ended up in high-kill shelters (mostly in California). An amazing group – The Miracle GSD Network – https://www.facebook.com/groups/310605105708097/ swooped in and saved these marvelous creatures. Through outreach on public media (mostly), funds are raised to rescue the dogs from the shelters, initial veterinary care, and cover transportation to rescue organizations throughout the United States. One story that illustrates, to me, a true hero, is this story. This is Jill’s story of her Miracle Dog, Cali. Cali has had all kinds of health issues, but Jill has persevered and given Cali all the love and care any dog could hope for. My heart goes out to Jill, her family, and her sweet Cali. If Jill isn’t a hero, there is no such thing. Guthrie T Knows He’s Now Safe and Loved! Everyone who reads my blog knows how I feel about adopting seniors. One look at the “before” and “after” photos here will see exactly why I’m such a proponent of adopting a rescue, and why seniors ROCK! The following story was shared with me by the wonderful folks at the Thulani Program. I’m so very grateful that they keep me up-to-date with their wonderful stories. I feel especially close to Guthrie T in that we were able to donate to help with his surgery and medical care. I hope you will open your hearts to Guthrie’s story and enjoy hearing how The Miracle GSD Network and The Thulani Program are making a huge difference, one dog at a time. This boy was found wandering in early July, and was picked up by Moreno Valley Animal Control and taken to the shelter. While there, Guthrie was friendly with everyone, got along great with his kennel mate, and even tested fine with small dogs. No one knows about the life he had before Thulani, but by the looks of him, it surely wasn’t good. He came to the Thulani Program pretty neglected, a mess, and had a bloody ulceration on his toe that surely had to be painful. Thulani offered Guthrie T. a better life than his prior one, which he deserves, and he readily accepted. Thulani suspected his toe would need amputated and made immediate arrangements for him to go to the vet upon leaving the shelter. Thank goodness they did. Guthrie T. had a few more obstacles to face. He was very sick once he was pulled out of the shelter, bordering on pneumonia. He had to wait two weeks to feel better before the vet could amputate his toe. With the help of Miracle GSD Network Thulani was not only able to save him but to obtain the necessary money needed to get him on the path to recovery. Guthrie T. is Miracle Dog #555. This boy is very sweet, but still a little scared at the vets. Guthrie’s a Happy, HEALTHY boy Now! Don’t forget to check in with the Miracle GSD Network on Facebook (https://www.facebook.com/groups/310605105708097/ ) Lots of happy stories and photos! 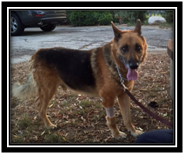 I am sending along a wonderful article written by Bay Area German Shepherd Rescue. They are one of the approved shelters working with the Miracle GSD Network. This article was posted by them back on November 13, 2013. I have added a few details that weren’t available at the time of that writing. Those details are inserted in bold italics. We work with a wonderful team called the Miracle Group to save dogs from across the US. It started in 2012 with a comment made in a Facebook PM by the eventual founder that went something like “wouldn’t it be great if we all contributed regularly to a fund that could be used to rescue a dog a month”. Such lofty goals!! A Dog A Month. It was that one comment to a handful of people with a dream to make a difference in the lives of a handful of dogs that launched the Miracle GSD Group – and there was no looking back. On October 29, 2012, the Miracle GSD Group pulled Taylor and Laku, 2 GSD’s from Coachella heading to the safety of Southwest Michigan German Shepherd Rescue. Southern California dogs from a very full, high kill shelter safely transported across the country to a GSD rescue in Michigan that does not have the same overcrowding issues that California (and many other states) have. The funds that were needed to pull, vet, board for a few days then transport these 2 lucky dogs were from “pledges” made on each dog’s public post, with the Miracle Group members filling in the difference. And it worked! Those two dogs were adopted in to loving homes within weeks and SWMGSR wanted to know if they could get a couple more. Beautiful, loving GSD’s that were abandoned with little hope of surviving the overcrowded shelter life now being loved and spoiled in their forever homes. Yes, there were more, too many more. The next month, November 2012 the Miracle Group pulled 13 dogs!! Three wonderful members of this group realized this could not continue without some serious organization and they got serious. New rescue partnerships were formed, “PLANS” were made and lives were saved. In July, 2013, the Group decided they needed a break. Nine months of chaos was wearing them out. They needed to slow down and take some time for themselves. That month they rescued 30 dogs! The most (at that time) in a month to date – on their break – because they would not say no to a dog with a PLAN. In one year the Miracle Group saved 226 dogs, pulled dogs from 37 different places in 6 different states going to 17 different rescues. These three ladies give their time, their skills and mostly their love and devotion (all with no remuneration) to save these dogs. They have families, soccer games, hockey games, jobs, business trips, dogs to walk, yet they find the time to save so many lives and all three of them live on the EAST COAST. THANK YOU, ladies, for ALL you do, for those you have saved and those yet to be saved and thank you to all the members of the Miracle Group who pledge, share, pull, transport, foster, board and help support the Miracle GSD Group. We are thrilled and honored to be a part of this amazing group. Since this article was written, so many more dogs have been saved thanks to the combined efforts of the Network and their associated rescues. As of this writing, 574 dogs have been pulled from shelters and sent to rescues across the country. It’s so remarkable that such a small group can do so much good! I think it proves that if you really want to do something ‒ you CAN! Remember, I really love to hear your comments. Just click on the “Reply” link and let me know what you think. Also, let me know if there’s something you’d like to hear more about.